The long-standing activity in the academic world, the permanent contact with structural engineers from many generations, but as well with real problems of structural design in generally, namely with reinforced concrete, made us aware of the lack of some published papers in the country to treat current concepts of structural design, especially the computation and detail measures procedures, in a modern manner, at the level of current knowledge. Considering the significant seismic activity, practically on the extent of the entire national territory, the professionals’ interest naturally focuses on the issue of seismic response during strong earthquakes. The rapid evolution of knowledge in the field, to a great extent reflected in seismic building design codes, cannot always be tracked at the same rate by the practitioner structural engineers. On the other hand, the complexity of the current approach of seismic building design naturally creates difficulties to debutant engineers in a profession in which experience is a real requirement. 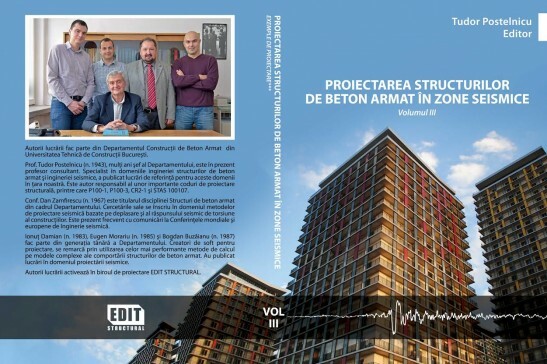 The valuable treatises dedicated to reinforced concrete structures field, published by eminent representatives of the academic world and of the structural building design, such as Professors M. Hangan, M. Mihăailescu, R. Agent, have a considerable antiquity and nowadays cannot provide anymore the necessary scientific and technical information. The paper we propose was motivated by our desire to consign to structural engineers a material helpful when needed in more complete clarifying of modern structural engineering fundamentals in seismic countries, as well as in deciphering some procedures of calculation and building design measures, whose basis is not transparently presented in building design codes. We consciously assumed a mission obviously difficult, hoping that we will succeed to fulfill it honorably. If we succeeded or not, this can be proved only by readers. The paper is structured in three volumes.